14mm microcellular base with 5mm PVC surface. Comfortable, slip-resistant bubble surface texture. High friction backing - grips smooth surfaces. Resistant to most fluids and chemicals. Slip resistant to R10 standard for DIO 51130 and BGR181. Bevelled edges to reduce trip risks. Linear metre lengths available to special order. When working in manufacturing or other industrial businesses, many employees spend the majority of their working day standing in one place which can often be very draining for them both physically and mentally. 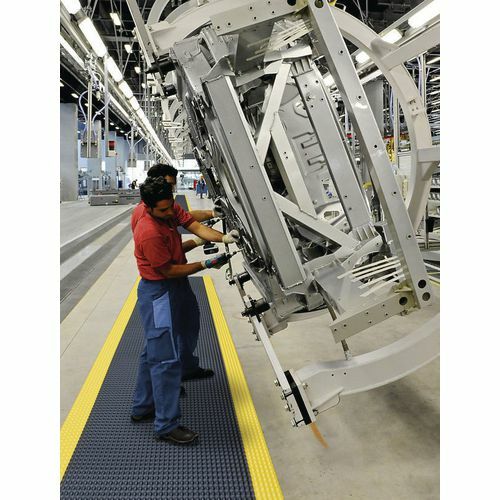 Our premium anti-fatigue industrial matting helps employees to tackle fatigue due to standing up all day, which will have a positive impact on productivity. They are for heavy duty industrial use and they have a 14mm microcellular base with a 5mm PVC surface, together they create a 19mm platform which provides workers with excellent comfort. 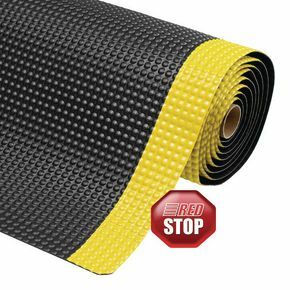 The matting is slip resistant as well and being resistant to most fluid and chemicals; the bubble surface texture adds further comfort for workers, as well as fatigue relief and enhanced traction. 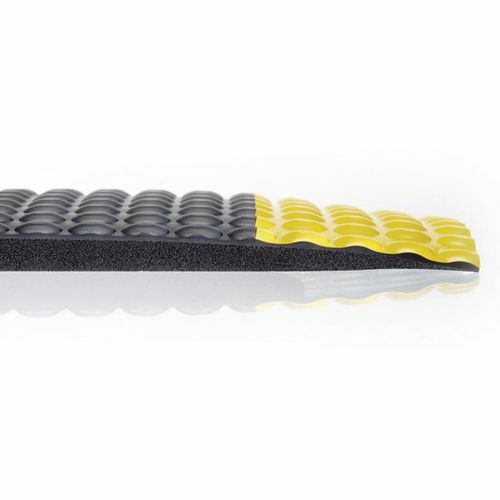 The high friction backing anchors the matting to smooth surfaces and the bevelled edges reduce the risk of someone tripping. Our premium anti-fatigue industrial matting is a great way to keep your employees alert and comfortable during work; they are available in a choice of two colours; black or black/yellow and a choice of two sizes; 910mm x 600mm or 1500mm x 910mm. They come with a 12 month guarantee and FREE UK Delivery.